Both industry and environmentalists were paying close attention to yesterday’s House Subcommittee on Energy and Environment hearing on the “fractured science” behind the groundwater (not drinking water) contamination research in Pavillion, Wyoming conducted by US Environmental Protection Agency. On December 8, 2011, the EPA released a draft report recapitulating the findings of their investigation. “Investigation” is too strong a word, because the point of the hearing was to find out why EPA released the draft report before key results were reproduced, or before the study was even peer reviewed. EPA’s draft report has been exploited by environmentalist zealots, so it is strange that the Agency failed to vet the document before it was released. This is especially true in light of the many methodology problems alleged by state and industry officials. Fracking, the gas extraction process in which several tons of pressurized water laced with sand and a small amount of chemicals are injected through the drill hole to break up apart shale rock so trapped gas can flow more freely, has been improved by the new technology of horizontal drilling. The ability to drill horizontally is valuable because it can reach and recover more gas that is inaccessible by vertical drilling alone. This is a new and valuable practice that involves environmental precaution, so it’s only natural for environmentalists to jump to conclusions. Unfortunately, so is EPA. EPA’s report nabbing fracking as the culprit of water contamination in Pavillion has come under scrutiny for its inability to uphold the protocols of scientific professionalism. Let’s begin with EPA’s involvement from the outset and how they arrived at their “hypothesis.” The first complaint of contaminated ground water in Pavillion took place in 2005. From 2005-2007 a study was conducted by independent laboratories, concluding that there were no impacts from oil and gas development. In 2008, EPA received complaints from domestic well owners about the smell and taste of water following fracking operations at nearby gas production wells. Despite the fact that no natural gas wells in the Pavillion Gas Field had been fracked since 2007, the EPA took on the task. EPA performed shallow domestic and stock water well sampling and testing during two phases in 2009 and 2010. EPA drilled two monitoring wells in the Pavillion natural gas field in the summer of 2010. Their testing of 9 samples by three 3 labs resulted in a single detect of a contaminant of concern: a synthetic organic compound, 2-butoxyethanol. EPA admits that the methodology used to determine the 12.7 parts per billion detection of this compound was still under development and is an untested, unverified protocol. This level of 2-butoxyethanol is acceptable for drinking water from a public water system. Still, EPA reviewed Material Safety Data Sheets which led to the identification of 2-butoxyethanol as a chemical also used in hydraulic fracturing. EPA’s assessment: the ground water contamination was caused by hydraulic fracturing. But EPA failed to mention that additional testing was needed before implying that fracking was the cause of contamination at Pavillion. EPA’s report shows that both monitoring wells were completed in natural gas reservoirs, of all places. The natural gas found in the monitoring wells matches that natural gas identified in production wells and does not match the natural gas found in the landowner water supply wells. Keep in mind that no wells near the two monitoring wells that EPA set up have been fracked since 2005. EPA’s assessment is still waiting to be peer-reviewed. Before the Agency released the controversial draft report, Wyoming state agencies were not afforded the opportunity to review the data. Tom Doll, the State Oil and Gas Supervisor of the Wyoming Oil and Gas Conservation Commission, testified, “EPA dismissed requests to review data before it was publicized and has not addressed concerns with the data and the Pavillion Draft Report as raised by the Wyoming Oil and Gas Conservation Commission, the Wyoming Department of Environmental Quality, and the Wyoming Water Development Office.” He stated, “Several times during 2011, the Working Groups asked the EPA for the release of the monitoring well data. The EPA said the data was going through Quality Assurance-Quality Control review and was not available. The data was first provided to the public and to the state agencies in November, 2011. The EPA made public the Pavillion Draft Report on Ground Water in December, 2011.” Why would EPA shield a highly influential, yet preliminary report from state scrutiny? Also troubling is EPA’s failure to consult the United States Geological Survey (USGS), which has documented Pavillion water as “unsatisfactory” due to naturally occurring sulfate, total dissolved solids and pH levels. 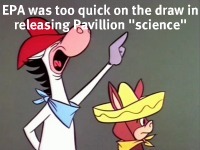 EPA’s press release claiming that the deep water samples it had collected from Pavillion, Wyoming, “indicates that ground water in the aquifer contains compounds likely associated with gas production practices, including hydraulic fracturing” was premature. Even Mr. Jim Martin, Regional Administrator of EPA’s Region 8, admitted, “Our analysis is limited to the particular geologic conditions in the Pavillion gas field and should not be assumed to apply to fracturing in other geologic settings.” However, the media move proved successful in convincing some leaders that the contamination validates fracking concerns. Delaware Governor Jack Markell cited EPA’s Pavillion report when he decided recently to put off drilling in the Delaware River Basin. In 1959 the USGS documented Pavillion water as “unsatisfactory” due to naturally occurring sulfate, total dissolved solids and pH levels. But, as fate would have it, the EPA failed to consult the USGS for their report. Almost 100% of Wyoming’s oil production, 153,300 barrels per day, and 36.2% of Wyoming’s natural gas production, 2.4 billion cubic feet per day, comes from hydraulically fracked wells (OGCC September, 2010). EPA’s premature revelation has unfairly stained an industry that is leading private-sector job growth in America. Unfortunately, “scientists” have been breaking the rules about data, studies, and accuracy since the global warming controversy began, so it is not surprising that EPA would play fast and loose with data and conclusions. The sad thing is that while science data used to be trustworthy, now we have to take reported data and conclusions drawn from it with a grain of salt. The EPA’s actions here have not enhanced their reputation for accuracy. Actually BEFORE the global warming controversy began. Love Canal was a case of hysteria. The State of new York did a great study using carefully measured exposures of people near Love Canal and found no problems at all. Observed incidence fell with one standard deviation in all cancers studied. There ere lots of other Delaney amendment scars too.